In town for All-Star events? Don’t have a ticket to the game? Join us for a brewery tour of Minneapolis! Join up with other craft beer lovers for a Bitter Minnesota Public craft beer tasting tour. This is a great way to see Minneapolis, taste great local craft beers, and experience Minnesota’s unique craft beer culture. At each brewery stop, there will be an opportunity to taste flagship beers, as well as some new craft beer creations and seasonal specials. Rates for 3-hour public join-in tours start at $75. How much beer am I getting, again? You get about a pint’s worth at each stop. All tours include at least one stop where you get a flight. Bonus: you can bring your own beer too! Breweries do not serve food. That’s usually not a problem, because there is always a food truck parked in front of each brewery and you can bring food inside. We will make sure to tell you at the beginning of the tour what food truck options are available that day. Food is not included in the price. We staff each Bitter Minnesota tasting tour with one of our friendly tasting guides to ensure a safe and memorable experience. Our hosts help you make beer selections, answer questions and introduce brewery staff (when available). 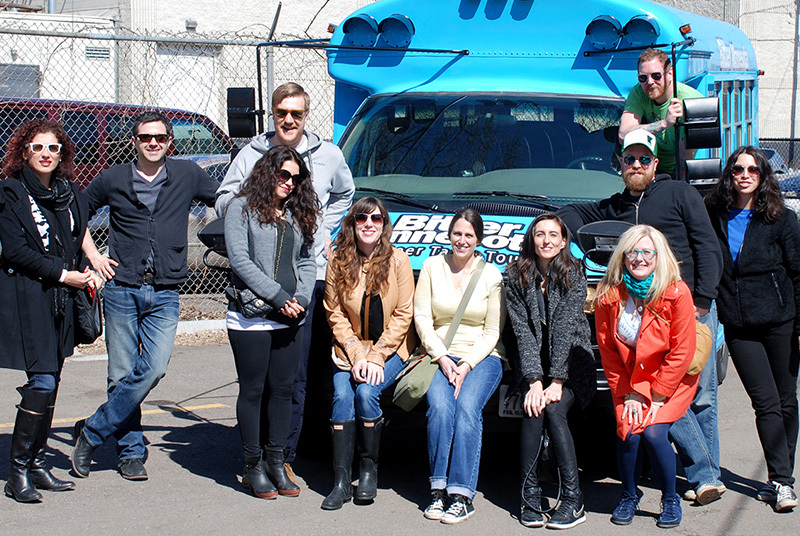 Enjoy Minnesota’s finest craft beer tasting tour experience in style as you hop on our little 14 passenger brew bus. The bus is hip, clean, and maintained like a champ for everyone safety.